The Spain & Portugal 2018 prestigious Michelin guide, presented tonight in Tenerife, has awarded ENEKO restaurant at Larrabetzu (Biscay, Spain) with one Michelin star. Newly opened during spring 2017, the restaurant offers traditional Basque cuisine, in a cozy and modern environment, with a relaxed atmosphere. Moreover, ENEKO restaurant offers live cooking which allows the diners to see from the table how the chefs elaborate the dishes. With the aim of “returning to the origin”, the work created at ENEKO restaurant is based on what Eneko Atxa has defined as Sutan, which means “on fire” in Basque. Dishes designed to be cooked in front of the diners. At ENEKO the menu is elaborate with Basque and seasonal products, you taste the land, the culture and Basque traditions. A staircase and vineyard join the Eneko Atxa’s two culinary spaces in Larrabetzu. The Azurmendi***restaurant, recognized with three Michelin stars, and the new ENEKO restaurant, now with one star, located above the Gorka Izagirre winery. The new ENEKO restaurant wants to return to the origins to fortify the ‘essence’ of Eneko Atxa’s ‘home’. There is room for 65 diners, with an open kitchen in view, and an additional private room for 35 more people. A building that relates to the keys of Eneko Atxas´s identity: Rock, the traditional symbol of strength in the Basque culture and wood, that represents the warmth and closeness that he wants to exude through his new concept. What is the ENEKO concept? ENEKO is the culinary concept created by Eneko Atxa in 2016 that was implemented for the first time in the restaurant at Hotel One Aldwych. A return to the origin with authentic offerings that maintain the basis of Eneko´s cuisine: flavor and technique. The spaces in London, Tokyo, and Larrabetzu were created by Eneko with the objective of letting the world experience Basque cuisine in an authentic and real way. 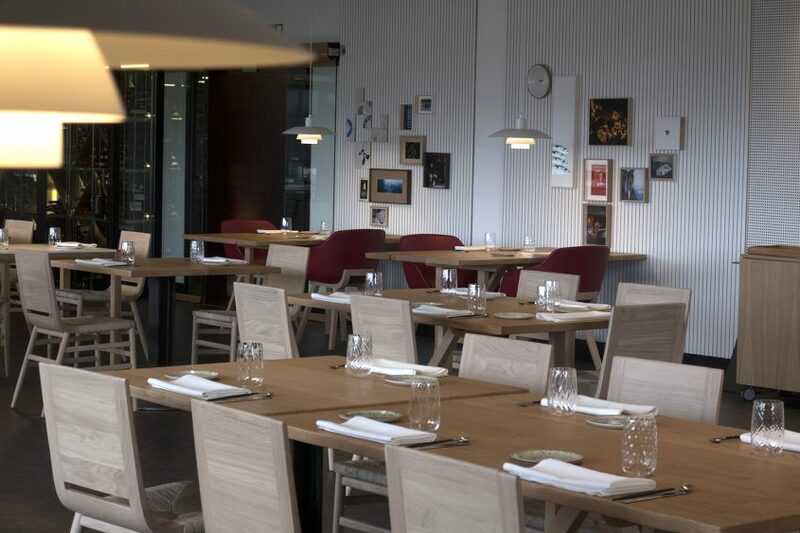 The space where Eneko Atxa has the two restaurants is a unique place; the chef has made that green hillside the center of a culinary ecosystem that works like a beating heart. His work with small farmers in the area, the recycling and the use of local produce, are some of the elements that define Eneko’s passion for sustainability. His cuisine is flavour, texture, and aesthetic. The influence of homemade food and roots are captured in every plate as the base from which departs to build textures and techniques that create truly outstanding dishes. The strength of each dish is in Eneko’s DNA, in his origins, in the authenticity of its traditional flavour which he seeks to define as the highest form of flavour. Back in the day, Eneko was the youngest Chef in Spain to obtain 3 Michelin stars. Was deemed the Most Sustainable Restaurant in the World by The World’s 50 Best Restaurants. Azurmendi is also the Best Restaurant in Europe according to OAD (Opinionated About Dinning). It is also considered Number 1 in the World by Elite Traveler. 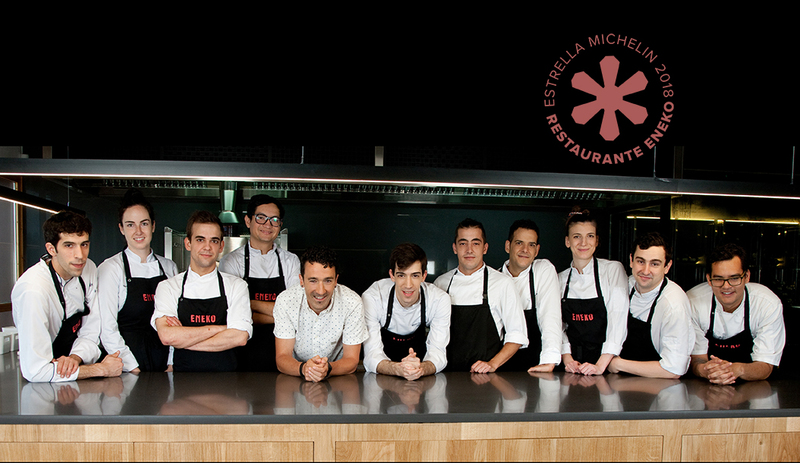 Eneko Atxa is the National Gastronomy 2015 Award holder and forms part of the European’s Young Leaders group.